Acorus calamus, commonly known as Calamus, Sweet Flag, and Cinnamon Sedge, is a reed-like plant common in Europe and North United States. It grows in swamps, marshes, and very moist places. It is a herbaceous perennial growing from spreading, fleshy rhizomes. The long, sword-like, deep green pointed leaves grow up from the rhizomes. Calamus has ever been a favorite popular remedy. Its principal use seems to have been that of a tonic and blood purifier, for which purpose bits of the dried rhizomes are masticated and the saliva swallowed. It undoubtedly is a tonic, and it also has a beneficial stimulating and antiseptic effect upon gums and teeth. Chewing the rhizomes is also said to clear the voice. 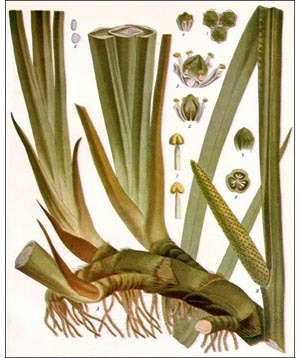 Calamus is, or has been, used in flavoring beer and gin. Country people add it to whisky, wine, and brandy to make a tonic bitters for the weak and dyspeptic. It is said that the Turks employ it as a preventive against contagious diseases. In India it is used to destroy vermin, especially fleas. In England it is employed in the treatment of malaria. At the present time calamus is no longer extensively employed in medicine. It is considered as a stimulating, aromatic, and bitter tonic. It is perhaps true that its value as a tonic is at present somewhat underestimated by the medical profession. It is also serviceable in flatulent colic, and in what is designated as atonic dyspepsia. It is added to other medicine, either as a corrective, or adjevent.